This lovely octagonal Market Umbrella is made in solid teak, not in a weaker wood that may warp or rot. The 10' umbrella with 2" pole fits Kingsley Bate 60", 66", 72", 92" and 98" dining tables. 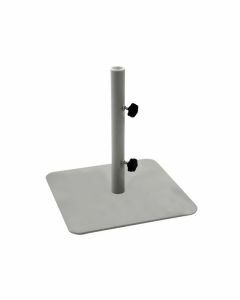 We recommend the solid metal base with each umbrella which fits neatly underneath your table. The combination of teakwood and Sunbrella outdoor fabric creates a market umbrella of superior quality. For your convenience, we have added a pulley system to the market umbrellas. This addition will facilitate the raising and lowering of the canopy. This umbrella is available in a variety of fabrics. Please click this LINK to view the fabric choices. Please note each fabric grade has a different cost. Please choose the fabric grade from the drop down menu and enter the number and name of the fabric in the space provided. The 10' Market Umbrella coordinates with 50lb BASE. Note that the base is sold separately. Please contact Customer Service with any questions. Click on images for greater detail. This item ships via motor freight. Freight charges calculated during checkout are approximate and additional freight charges may apply depending on your location. If you are interested in purchasing this item, please call us or email Customer Service for a shipping estimate. *We have a low price policy. If you see this listed for somewhere else, e-mail us and we will match the price.